When I first moved to Germany, I was enchanted by the cobblestone streets in my city (I know, it doesn’t take much). Every day I traipsed – and tripped – along them, feeling ridiculously European. In fact, I was so charmed that it took me a while to notice that some of the cobblestones weren’t stones at all. Instead, they were inscribed brass squares. As my German improved, I learned what they said. Here lived Sofie Rosenthal. Born 1888. Deported 1940. Murdered 1942. Auschwitz. Here lived Julian Rosenthal. Born 1878. Deported 1940. Murdered 1942. Auschwitz. 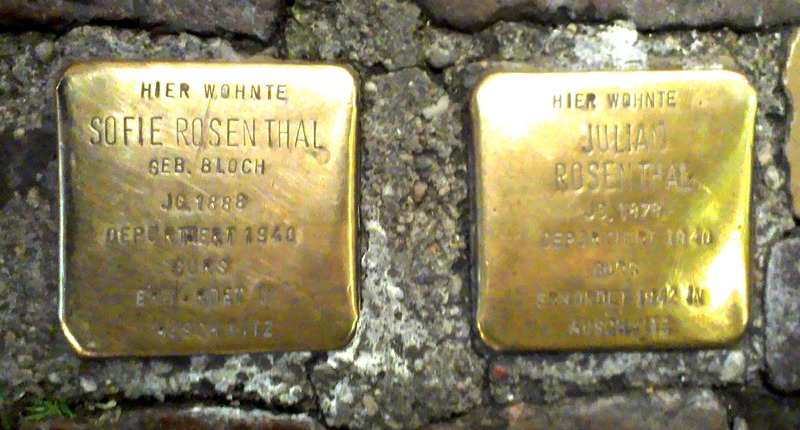 These brass memorials are “Stolpersteine,” or “stumbling stones.” They’re the work of artist Gunter Demnig, whose been installing the monuments in front of the former homes of Holocaust victims in cities throughout Europe. There are over 300 stones in my city. 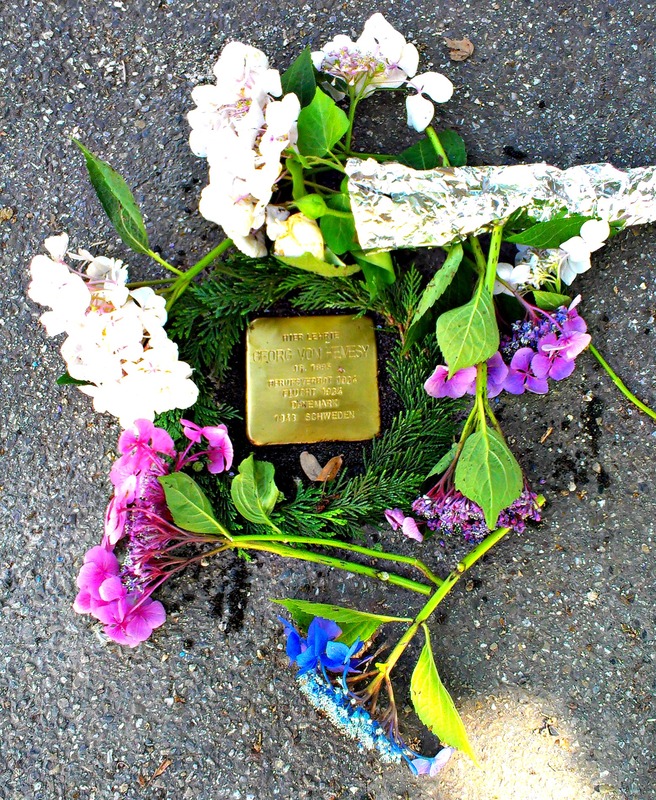 Lately I’ve been thinking about how the Stolpersteine function as a form of immersive interpretation – telling stories in situ, instead of centralizing them in museums or collective memorials. My walk to work is a memory path, but what does it mean to integrate memorials so directly into communal spaces? How important is it to be able to self-select out of memorial experiences? Unless you really plan your route, it’s almost impossible not to come across these stones in my city. Do people’s responses to memorials change when they aren’t given a choice about when and where to encounter them? Should memorials be destinations or moments? Should experiencing and remembering be a planned event that takes time and effort, or something scattered that appears whether you’re looking for it or not? When engagement isn’t intentional, do memorials become invisible? Do smaller-scale memorials make engaging with history more approachable or more ignore-able? Does the scale make it more personal and meaningful, or more readily overlooked? Does the public pay more attention to thousands of names, or just one? Does immersive memorial continuously remind people of the past, or does it become just another part of the present? How much should remembrance be a part of our daily lives? What do you think? Are there similar types/styles of memorials where you live? How do people engage with them?